Today's contact lenses can handle almost every kind of optical challenge glasses can, including presbyopia, an age-related lens issue that can make your near vision blurry. Just as you can get bifocal, multifocal or "progressive" lenses to compensate for presbyopia, you have a choice of several different types of multifocal contact lenses here at Maple Ridge Eye Care. Our optometrist in Maple Ridge (Dr. Hurlbert, Dr. Matter, Dr. Lee or Dr. Rughani) can provide all the necessary testing, measurement and fittings for your new multifocal contacts. 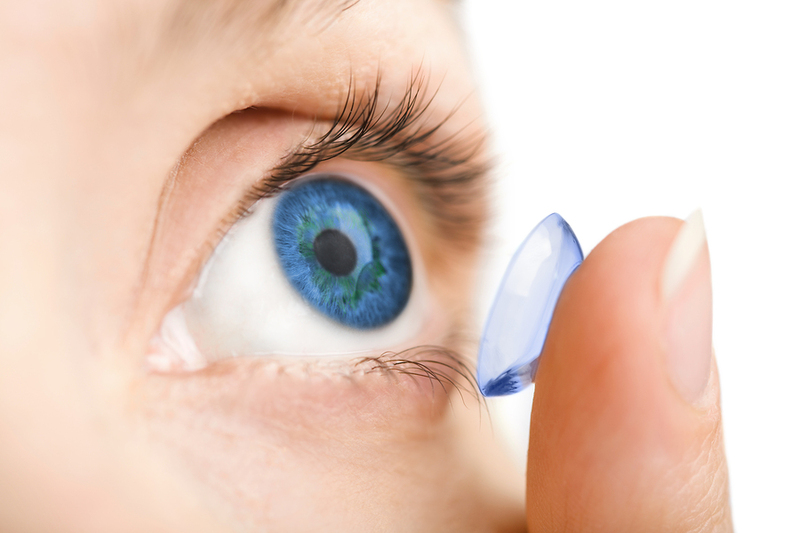 Do You Need Multifocal Contact Lenses? If you're over 40 and have been having trouble reading the fine print of medicine labels or doing fine manual work lately even though you have never been diagnosed with myopia (nearsightedness), then you probably have presbyopia. Normally the intraocular lens of the eye flexes to shift its focus from distant objects to close-up ones. After the age of 40, however, the lens stiffens and loses its ability to bring the near field into clarity. Bifocals, trifocals and progressive multifocal lenses compensate for this problem by giving you multiple corrective lens powers so you always have the degree of correction you need for near, midrange or distant viewing. Concentric ring lenses - These contact lenses place the different vision fields in alternating concentric rings, with either the hear field or the distance field in the center. Aspheric lenses - These lenses position the vision fields similarly to concentric ring lenses, only with a blended or progressive gradation. Translating lenses - Also known as alternating lenses, these contacts place the near and distance vision fields in separate parts of the lens. These lenses, which are designed so the corrective fields won't shift on you, are only available in RGP material. Monovision lenses - These bifocal contacts are an interesting alternative for people who have trouble dealing with other types of lenses. One lens has a single-vision distance correction, while the other has a single-vision near correction. Your brain learns how to use each field as needed. Call 604-463-4469 or book online to schedule an exam from an eye doctor at Maple Ridge Eye Care, your source for the latest multifocal contacts.